She quickly discovered, however, that Gracie had her own agenda, and it was all dog. From chasing squirrels to jumping fences to the occasional roll in dead fish, Gracie taught Jan that life is for living, not dreading. As she began to realize that Gracie was helping her manage her anxiety, Jan also came to a new awareness of how a loving God provides healing through His own works of creation. Part memoir and part medical exploration of the truly healing gifts that God freely offers us through our interaction with animals and nature, Saved by Gracie is a story of God's redeeming love revealed at the paws of a dog. Jan Dunlap is the author of the humorous Bob White Birder Murder Mysteries (all five of which have been nominated for the annual Minnesota Book Awards) that follow the adventures of a really nice guy who finds dead bodies when he's out birding. A degreed theologian (she has a masters degree in Theology from the University of St. Catherine in St. Paul, Minn.), Jan has written extensively for national Christian magazines for almost 15 years, and teaches English online as an adjunct for New Mexico State University (thanks to a masters degree in English Studies from Minnesota State University-Mankato). She is the mother of five children and lives in Chaska, Minnesota, with her husband Tom, her daughter Colleen, and (or course) their dog Gracie. 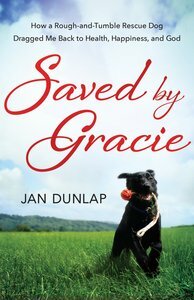 Customer Reviews For "Saved By Gracie"
Saved by Gracie is the true story of Jan Dunlap and her black Labrador cross, Gracie. Jan struggled with anxiety and depression, and was extremely resistant to owning a dog. She succumbs to the convincing attempts of her husband and daughter and they rescue Gracie from a shelter. The book tells of all the ups and downs Jan encounters while trying to train Gracie. I found this quite an easy and enjoyable read, as I could relate to some issues the author touches on in her story. I have also adopted a dog from a shelter. I had some good laughs whilst reading this book, and a few tears. Overall, I thought it was quite a lovely story.